It is just a number, but having arrived here, I like the idea of marking my 550th post. Most days this week I have enjoyed the garden by getting up early, between 5:00-6:00 a.m., to take pictures, water certain plants and spend some time in quiet reflection before the neighborhood starts bustling. 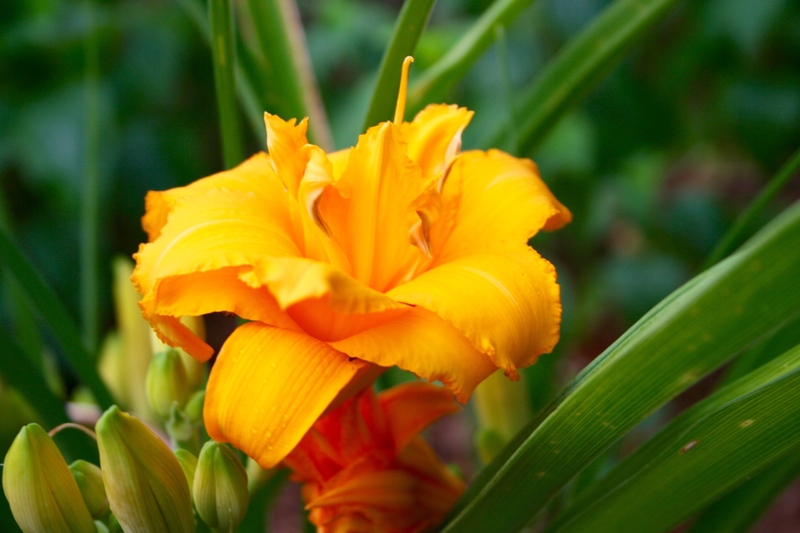 A red Daylily started flowering a week ago, this yellow one opened today. 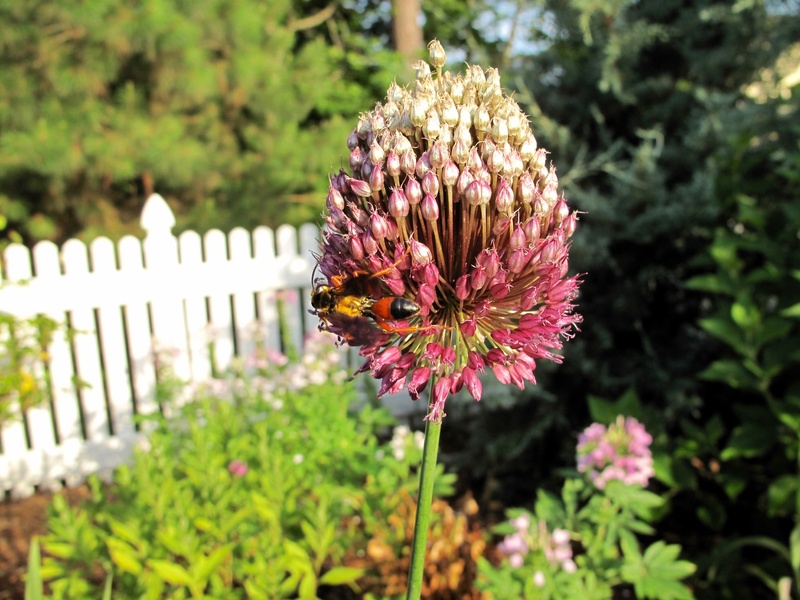 Wednesday I noticed a colorful creature spiraling an Allium Atropurpureum. Perhaps someone will be able to help me identify it. 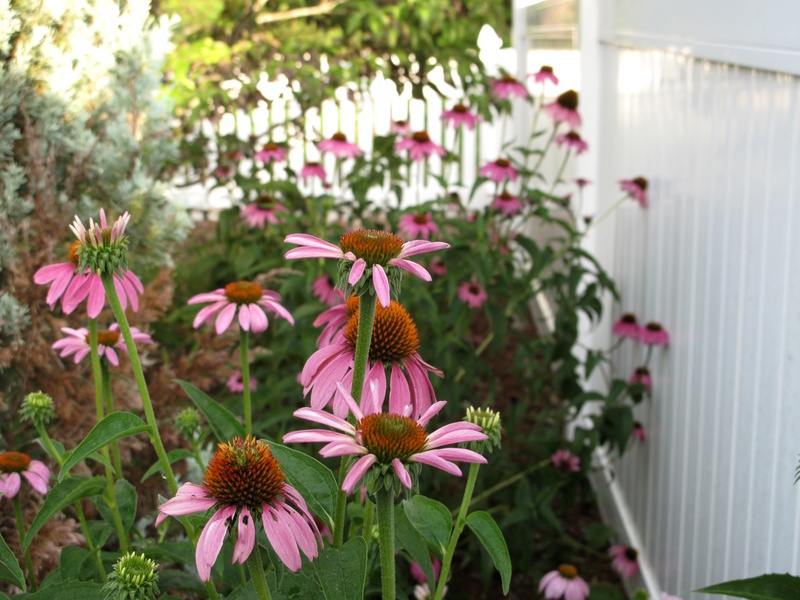 Scattered all around the garden, Echinacea purpurea has been reliable in the heat. Some planting of echinacea received no extra water during this drought, but I watered this section fairly regularly since I was watering nearby. 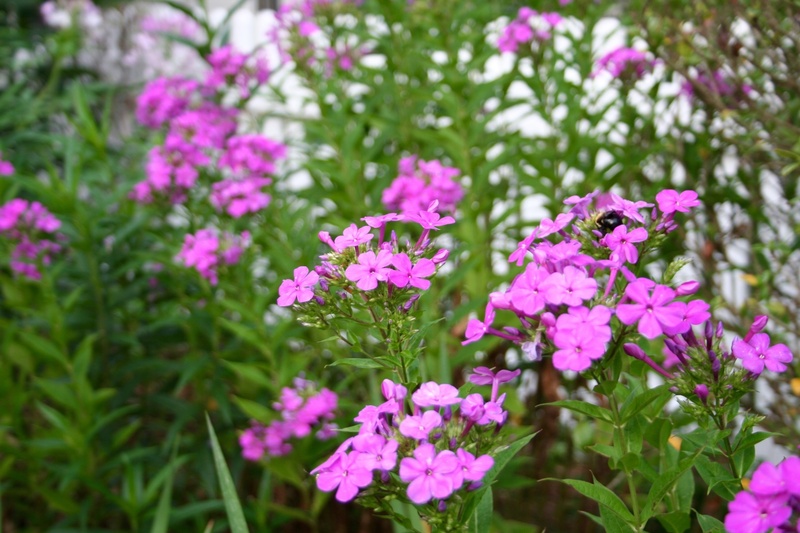 Even drought-tolerant plants such as this one respond positively to some attention. 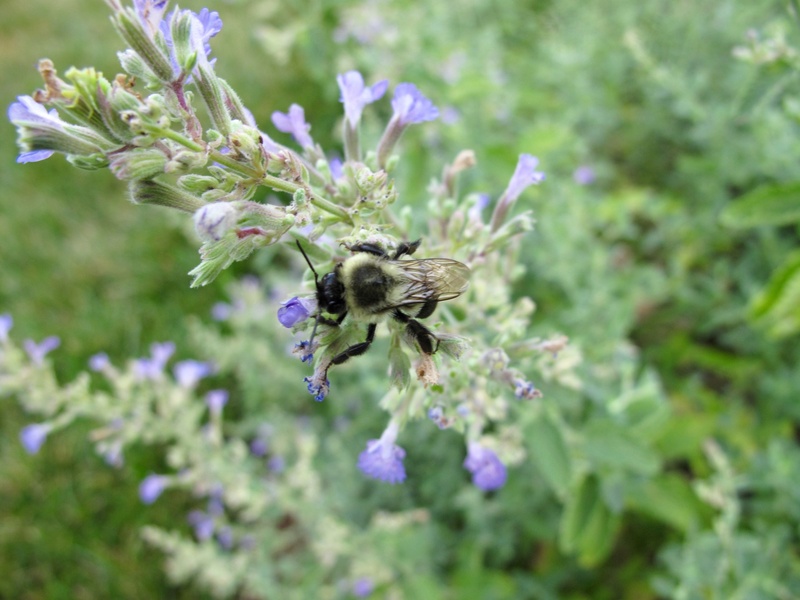 Bees are becoming active at this early time of day, but frequently during my walks I have come upon them asleep on Echinacea and once, on Nepeta ‘Walker’s Low’ (Catmint). 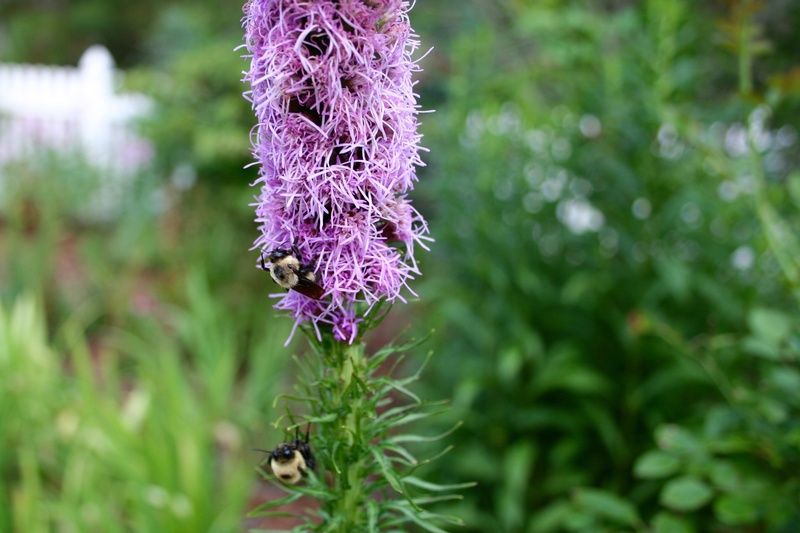 Another bee pair was lazily hanging out on the spire of a Liatris spicata. This one is the only liatris that has kept its dignity during the recent heat wave. 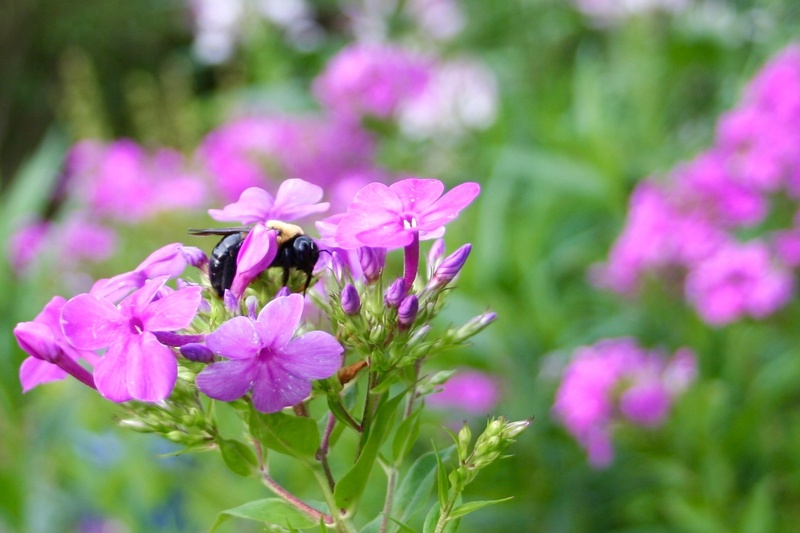 Phlox paniculata (Garden Phlox) came into its own this week. 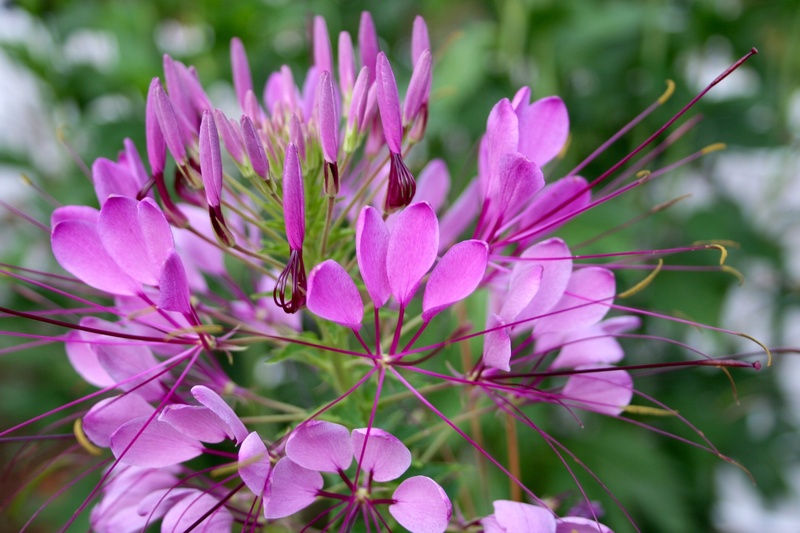 Along with Cleome it helped to fill in some gaps along the fence in the western border, attracting more bees at the same time. 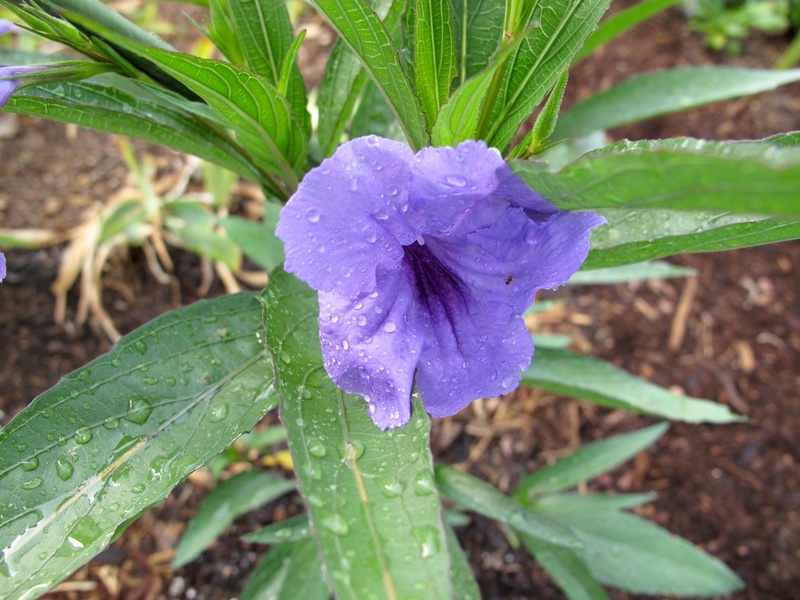 A recent addition to the garden, Ruellia brittoniana ‘Purple Showers’ (Mexican petunia) is taking its time getting adjusted to its new home. Eventually it should make a nice large clump and overwinter, I hope. There are a couple of new flowers each morning, gone later in the day—the bunny or some other phenomenon? I have not seen the rabbits in 4 or 5 days nor have I come upon an abandoned little blue velvet jacket. 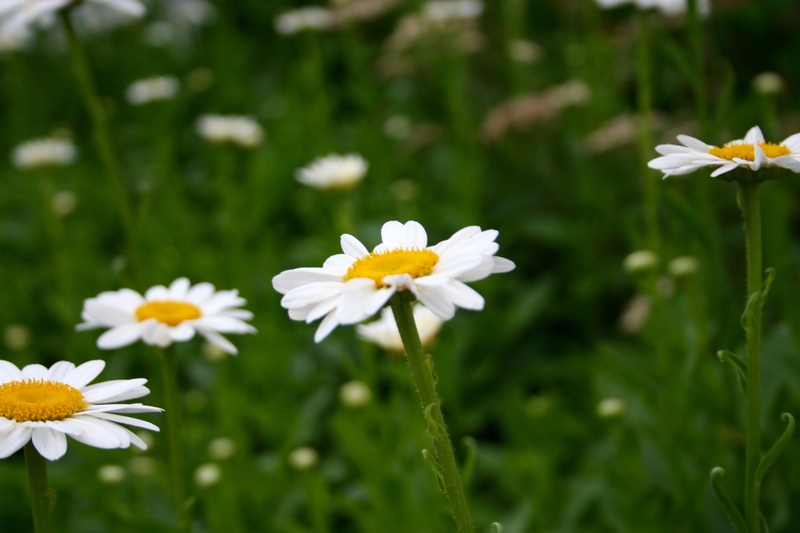 Under the screened porch a long border was overtaken years ago by Shasta Daisies. When they first come into bloom they are fresh and inviting. Always too quick for my camera on a few mornings there was a single hummingbird sipping among the Monarda didyma (Scarlet Beebalm). The blooms are drying out so one time the tiny bird caught a a long red petal in its long beak instead of finding nectar—I could almost see it trying to spit it out. Last night a huge storm passed us right by and hovered instead over the town of Chapel Hill. Several friends reported hail damage. Tonight a smaller storm carried some light rain our way for 45 minutes. The bird baths were filled only half-way, but the water should help refresh the garden. Have a great weekend. This entry was posted in garden and tagged Allium Atropurpureum, Cleome hassleriana (Spider Flower), Echinacea purpurea (Purple Coneflower), Hemerocallis (Daylily), Leucanthemum x superbum (Shasta Daisy), liatris spicata, Nepeta 'Walker's Low' (Catmint), Phlox paniculata (Garden Phlox), Ruellia brittoniana ‘Purple Showers’, summer garden on June 26, 2015 by pbmgarden.